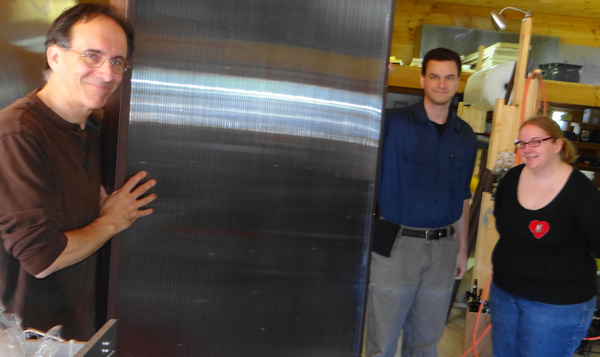 Tom Gocze (left), with son Peter and daughter Maria, with one of American Solartechnics' solar hot water panels. The Searsport company is aiming to produce more affordable solar hot water systems. SEARSPORT, Maine — It’s an irony not lost on many people. Those who struggle to pay their oil and electric bills and would benefit most from installing the latest energy-saving equipment often cannot afford the investment. Yet the extravagant house overlooking the harbor might have solar panels on its roof. Tom Gocze, whose American Solartechnics company has been designing and manufacturing alternative energy hardware for 30 years, recently returned to producing solar collectors that produce domestic hot water, the water that comes out of the kitchen tap and the shower head. Unlike the high-tech hardware that might run $10,000 or more, American Solartechnics is producing solar systems capable of providing a family of four with most of its domestic hot water, heated by the sun, at about $3,000 installed or about $2,000 if the homeowner can do most of the work. The solar systems are not new technology, said Gocze, and are in fact the result of years of testing, refining and studying real-world applications. The systems include roof panels that gather heat from the sun and transfer it to water or anti-freeze, then transfer the heat again to a tank full of water which can provide enough hot water for a shower. Often, a backup source is needed as well, such as an electric hot water heater. For Gocze, the science involved in using the sun to generate heat is remarkably simple. “Putting something black in the sun to get hot isn’t high-tech. It’s stupidly simple,” he said. Yet consumers will benefit from the years of work he’s done on that simple principle, he explained. Back in the 1980s, when solar hot water collectors — not to be confused with solar photovoltaics, which produce electric current — were beginning to be more common, Gozce tested three leading approaches. After rejecting the single-pane glass panels because they lost too much heat, he conducted a side-by-side comparison of double-glazed and triple-glazed panels and solar collectors that use vacuum tubes, all set up on his porch roof in Bangor, where he lived at the time. “And much to my chagrin, the triple-glazed kind of sucked,” he joked, saying it did not perform much better than the double-glazed version and presented other problems. The vacuum tubes worked well, but are more expensive, subject to damage and are “not necessarily the best fit for solar domestic hot water,” Gocze said. The vacuum tubes performed on a par with the double-glazed panels, “which was kind of surprising,” he said. Flash-forward to 2012 and the concept remains, but American Solartechnics has learned a few things. Instead of glass, the panels now use twin-wall polycarbonate sheets — essentially, a slightly corrugated plastic with a webbing separating the two sheets. The plastic greatly reduces the weight of the panels — down to about 35 pounds, instead of 100 pounds. And it holds up better than glass to dings from a branch or even a dropped tool. “If you poke a hole in it, you can caulk it,” he said. The frame that holds the panel together is sheet metal aluminum, lighter and cheaper than the heavier, extruded aluminum that larger manufacturers use. The panels are backed with an inch-and-a-half sheet of foil-faced rigid foam insulation. Gocze’s son Peter and daughter Maria worked Friday morning preparing the components of the panels, the heart of which is woven, overlapped, wafflelike aluminum rectangles. Affixed to these panels are copper tubes, which take up the heat gathered by the aluminum. The American Solartechnics solar hot water system differs from that of other commercial manufacturers in that it doesn’t weld the tubes to the collectors, saving labor. And rather than following the traditional rectangular shape, the company’s panels are 4-foot-by-4-foot, making them easier to ship and handle. Gocze’s systems also rely on the 120-gallon tanks he has designed and refined. They, too, can be shipped easily and put together on site. Inside them is a coil of copper pipe through which the heated anti-freeze from the roof passes, heating the adjacent water. “What we’re trying to do is a balancing act between performance and cost,” Gocze said, keeping the systems simple enough for do-it-yourself installers yet faithful enough to the technology’s potential. The firm’s goal is for purchasers to see a five-year payback on 60 square feet of panels. For more information, see americansolartechnics.com, or call Gocze at 888-866-8970.